Figure 1. Fertilization process in plants. A group of scientists at Nagoya University has succeeded in discovering AMOR, a sugar chain molecule that increases the fertilization efficiency in plants. AMOR was found to be responsible for activating pollen tubes to lead to fertilization. Moreover, through the collaboration between biologists and chemists, the group has synthesized a disaccharide, i.e. a double sugar, which exhibits the same properties as AMOR. This discovery is expected to lead to advances in research to improve plant fertilization efficiency as well as carbohydrate chemistry for plants. Nagoya, Japan – Dr. Akane Mizukami and Professor Tetsuya Higashiyama of the JST-ERATO Higashiyama Live-Holonics Project and the Institute of Transformative Bio-Molecules (ITbM) of Nagoya University, and their colleagues have reported their new findings on April 8, 2016, in Current Biology, on their success in identifying a sugar chain that activates pollen tubes to respond to attractant molecules that promote fertilization in plants. When pollen grains (male reproductive organ) germinate at the tip of the pistil (female reproductive organ), a pollen tube grows through the pistil. There have been many reports that suggest the presence of a compound that is present inside the pistil, which activates the pollen tube to respond to attractant molecules for fertilization, i.e. like a love potion sent out by the female organ to attract the male organ towards them. However, the actual nature of this substance has been a mystery up to now. Using Torenia fournieri as a model plant, Higashiyama's group and his colleagues have succeeded for the first time in identifying the activator for pollen tubes. This activator consists of arabinogalactan, which is a sugar chain specific for plants. The group named it as Activation Molecule for Response-Capability (AMOR), taken from the Latin word meaning "love" and "cupid", thus illustrating its function to bring female and male organs together, to promote fertilization in plants. Figure 2. AMOR assay to investigate the activation of pollen tubes to respond to attractant molecules. 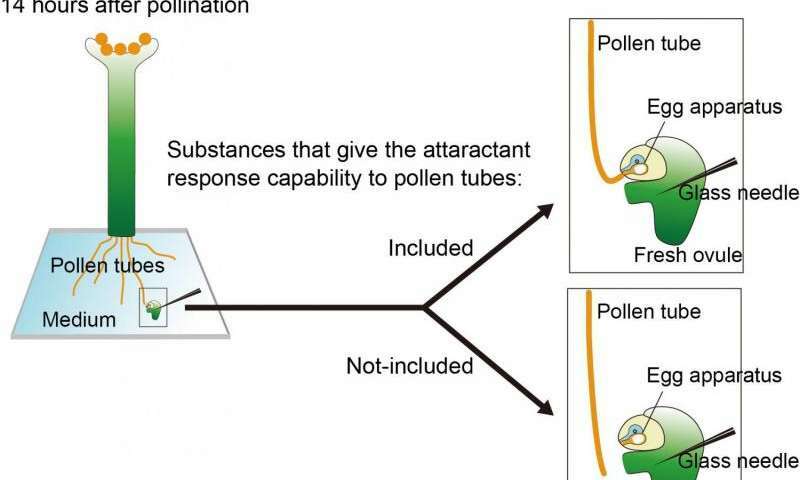 In their study, the group also reported that the two sugar units at the terminus of AMOR were the active component responsible for pollen tube activation towards attractant molecules. Thus, through the collaboration with synthetic chemists, Dr. Jiao Jiao and Dr. Junichiro Yamaguchi, the team synthesized a disaccharide that consists of methyl-glucuronic acid and galactose linked together. They found that the newly synthesized molecule activates the pollen tube to respond to attractant molecules, and lead to successful fertilization. "We are excited to demonstrate for the first time, that this terminus disaccharide, which is characteristic to sugar chains in plants, is responsible for the signaling between plant cells," says Higashiyama, project leader of the ERATO project and a Professor/Vice-Director at ITbM, Nagoya University. "This could lead to the development of new methods to improve the plant fertilization efficiency and open a new avenue for carbohydrate research in plant biology using synthetic chemistry approaches." 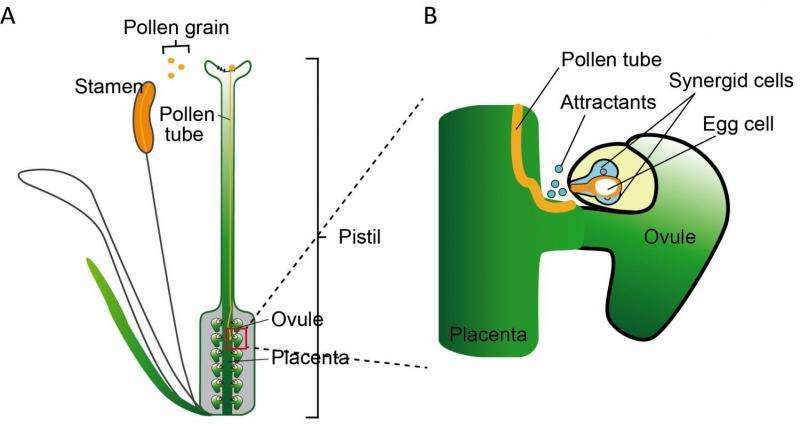 For fertilization to occur in seed plants (angiosperms), it is necessary for pollen grains to pollinate at the pistil, followed by germination and growth of a pollen tube through the pistil, with final delivery of the sperm cells to the ovules that contain the egg cells. Upon passing through the pistil, the pollen tube receives various substances, such as plant hormones and glycoproteins. In mammals, a phenomenon called sperm capacitation, which is where the sperm becomes activated by substances originating from the female organs, has been known for a long time. Thus, there has been much research ongoing to uncover its molecular mechanism. Similarly in plants, there have been reports on a phenomenon where pollen tubes receive attractant molecules that are produced from the two synergid cells located next to the egg cells, in order to grow their tubes towards the egg cells and lead to fertilization. However, the molecular mechanism on how pollen tubes become capable of responding to attractant molecules has not been uncovered. "In this research, I have used Torenia fournieri plants to develop new experiments to test which factors cause the pollen tubes to gain response capability towards attractant molecules," says Akane Mizukami, currently an assistant professor at the Aichi Gakuin University, who mainly conducted the biological assay. Torenia fournieri is unique in that the egg apparatus, containing the egg cell and the two synergid cells, protrudes from the ovule. Figure 3. Key disaccharide structure for AMOR activity. "By using this method to measure the activities in various parts of the Torenia flower, we found AMOR, the molecule which enabled pollen tubes to gain the ability to respond to attractant molecules produced by the synergid cells," describes Mizukami. Through the purification of AMOR, the group found that AMOR contains a sugar chain called arabinogalactan, which is characteristic for plants. Furthermore, by using a digestive enzyme specific for cutting the arabinogalactan sugar chain at various sections, the group was able to identify that a disaccharide moiety containing a methyl-glucuronic acid unit located at the terminus of arabinogalactan, was essential for AMOR's activity. The organic chemists in the group then synthesized the disaccharide moiety on the terminus of arabinogalactan. "Although I can now say it is easy, at the beginning when I joined this project, I struggled a lot to synthesize and isolate the sugar compounds, because I was not exactly an expert in sugar chemistry, and it was a new research field for me," says Jiao Jiao, a postdoctoral researcher in Professor Kenichiro Itami's lab at ITbM, Nagoya University. "I also find many organic chemists have the same feeling that sugar compounds are difficult to handle, especially when handling them in isolation." "It took me about three months to obtain the desired compound with a confirmed structure and good purity. The synthesis of this small sugar molecule was really like a total synthetic project. My mentor, Junichiro Yamaguchi (Associate Professor at Nagoya University) was an expert for making natural products, and he designed the synthetic route initially," continues Jiao. "We discussed and modified the procedure to make it better and better both in selectivity and yield. I guess the three months for me was really a precious time for studying new chemistry and getting a good experience for my future." Interestingly, when the β-linkage isomer of the synthesized methyl-glucuronosyl galactose disaccharide was added to the culture, the pollen tube was attracted to the attractant molecule. "This shows that this particular disaccharide was the key structure for AMOR activity," explains Mizukami. Other synthesized derivatives of the disaccharide were also added to the culture to see its effect on pollen tube response capability towards attractant molecules. The group also found that the methyl group on the methyl-glucuronic acid unit and the β-linkage between the two sugars was also necessary for attraction of the pollen tube. "This behavior of pollen tubes indicates that they are clearly recognizing the specific structure of the disaccharide." This new study has revealed the presence of AMOR, the sugar molecule responsible for controlling the pollen tube's response capability towards attractant molecules, which is an ability that is essential for plant fertilization to succeed. The arabinogalactan sugar chain is commonly present in the cell wall of plants and is known to be involved in various signaling pathways within the cell. However, effective analytical methods to identify the active sites on the sugar chain have not been well established and the exact role of the sugar chain structure has not been fully clarified up to now. Through the combination of a biological approach using various sugar-digesting enzymes and a chemical approach using synthetic sugars, the group succeeded in uncovering the active functional site on the plant's sugar chain. In addition, it was the first time that a specific sugar chain structure that is part of the extracellular matrix in plants, has been identified as a bioactive species that functions in the signaling pathway between cells. "The interdisciplinary research between biology and chemistry has been absolutely fantastic," speaks Jiao. "I feel super fun to talk and discuss about research with biologists. We share a different knowledge of science, experimental techniques and so on. We never feel shy to ask some "stupid" question because we are not only collaborators but also like friends or teachers to each other. I definitely want to and am looking forward to such kind of collaboration again in the near future," she continues. "This research is an outcome of a fantastic fusion between my colleagues, which include biologists in my lab, chemists in the Itami lab, as well as the Molecular Structure Center at ITbM," says Higashiyama. "I believe that the result of this collaboration not only sheds light on the long sought mystery of arabinogalactan sugar chains but will also advance the understanding of the yet to be resolved signaling pathway between cells involving sugar chains."